A dog that swam through the THAMES BARRIER lived to tell the tail after being rescued by the Port of London Authority (PLA). The feisty Jack Russell fell into the Thames and somehow paddled his way through the central gate of the world-famous flood defence, before being scooped out of the water by a PLA boat. Guy Underwood and Kevin Reynolds of PLA tug Impulse had just started a morning shift (10/5) near the barrier when they spotted a stunned dog walker shouting and gesturing at the Terrier, named Russell, who was powering his way through the Barrier towards Tate & Lyle Sugars. The PLA pair leapt into action, launching the authority’s small work boat Dory, before lifting two-year-old Russell to safety. They got him back to the foreshore and although barely able to stand from exhaustion, he seemed right as rain. 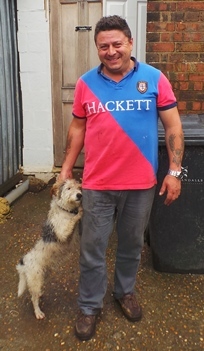 Russell’s owner John Pedro, who works at a skip hire firm about half a mile from the Thames Barrier, was overjoyed to have his “guard dog” back in one piece. He thinks Russell, who’s named after TV comic Russell Howard, might have been chasing after a fox.